Computers ready for recycling at a Scarborough depot. This is not your typical electronics shop. A laptop sits with a price tag of just $100. Large TV screens lay disposed on the floor. Aside, two men tinker with disassembled computers spread across a desk. 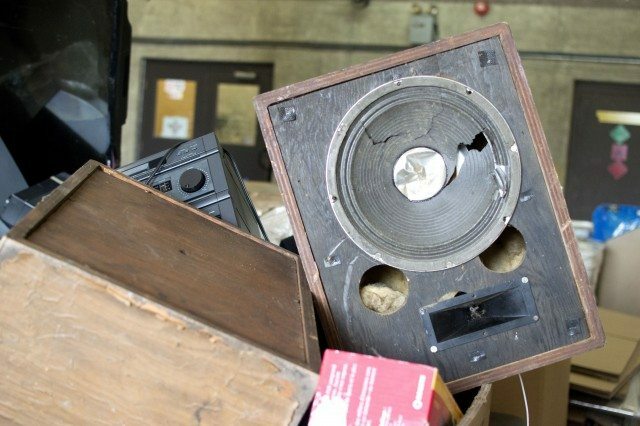 At the offices of Free Geek Toronto, a non-for-profit that collects and refurbishes donated electronics, broken, old, and unwanted gadgets find new homes—or get recycled. All sales fund technical employment and education programs for those who are marginalized. The organization’s efforts are just one way the city is fighting its growing problem with e-waste—old electronics that often wind up in landfills. There’s little distinction at Free Geek Toronto between refurbished and brand new. The organization does its best to salvage and repair items for a second life. Devices they can’t refurbish are sold to a province-approved recycler for safe dismantling. On any given day, some of the donations the company receives have been used to their greatest potential, while others look like they are fresh out of the box. Executive director Shannon Cummings points to the TV screens as an example: “There was this one flat screen that was cracked during a move, so the owners brought it right over,” she says. But bad moves aren’t the only culprits when it comes to creating e-waste. A lion’s share of the blame goes to planned obsolescence. There are constant efforts to improve hardware capabilities and increase the complexity of software in order to meet the expectations of users for faster response times. But these desires leave create a critical issue for developers: it’s often not possible to upgrade a single component of a device. That’s the impractical nature of today’s technology cycle: electronics still work perfectly well, but bigger and better products make them obsolete. Cue the walk to the city’s drop-off depot. The city takes in 1,064 tonnes of e-waste each year. This waste can include computer cords, big screen TVs, old phones, and laptops. To visualize how much waste this is, Derek Angrove, the City’s Director of Processing and Asset Management for Solid Waste Management Services, creates an apt comparison: it’s the equivalent of 53 tractor trailers. 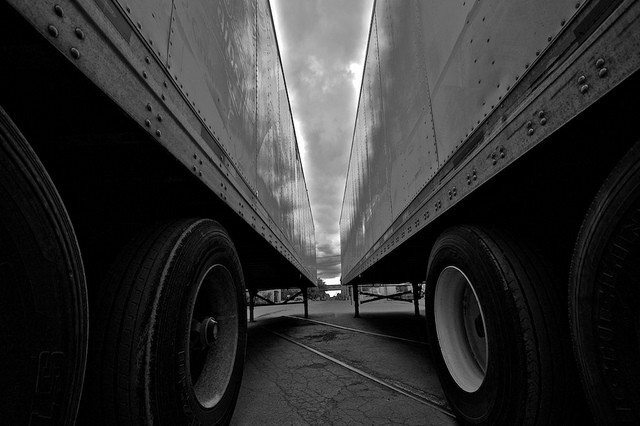 Fifty-three tractor trailers are equal in weight to the amount of e-waste our city produces in one year. Photo by apieceofglass from the Torontoist Flickr Pool. The city collects e-waste in a number of ways. Residents can drop off their unwanted electronics on a community environment day. The city holds over 40 of these events between April and October. The municipal government also operates seven drop-off depots across the city throughout the year. Additionally, Torontonians can take their e-waste to the curb on garbage collection day. Residents should leave the devices as-is on the curb—not in a garbage bag—so it is not mistaken for garbage intended for a landfill. All three options are free to residents. The City cannot recycle batteries, smoke detectors, and toner cartridges. The electronics then travel to collecting facilities and are sold to recyclers approved by the Ontario Electronic Stewardship. The “OES-approved” designation ensures recyclers are able to disassemble the devices in a safe environment. They recover precious materials like gold and silver, remove toxic substances like mercury and lead, and recycle as much as possible of what’s left. Ontario’s recycling programs aim to keep these materials from ending up in our landfills. The approved recycling facilities are a far cry from the unregulated dismantling facilities found in parts of India, China, and other countries with lax laws or enforcement, where local workers disassemble electronics in dangerous working conditions. 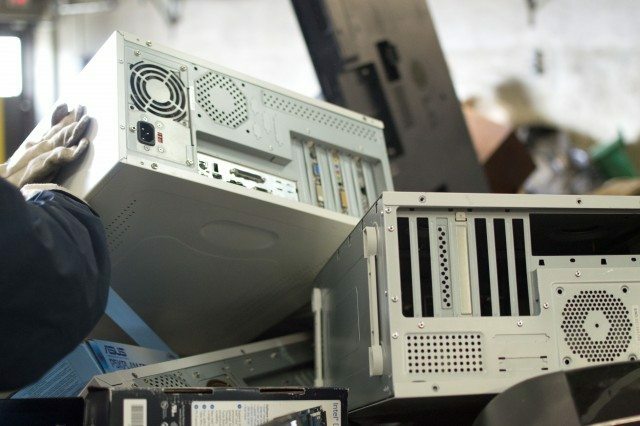 Angove says there are significant gains made from safely recapturing the precious metals in Toronto’s e-waste—that material won’t end up being extracted from the ground again. 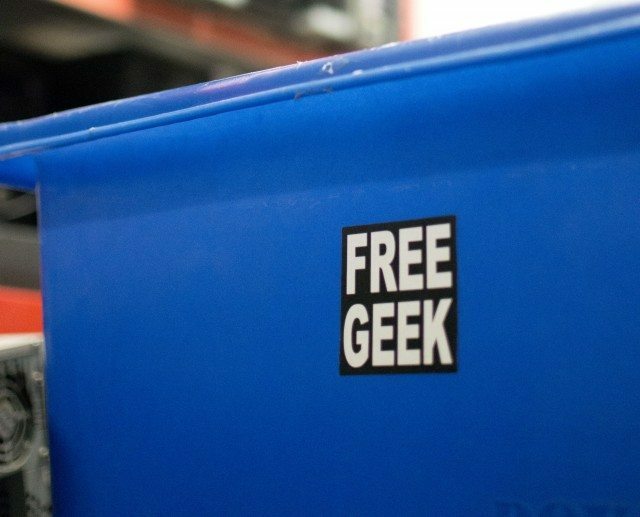 According to the OES, one tonne of smartphones can produce 324 times more gold than one tonne of ore.
Back at Free Geek Toronto, Cummings says the reuse movement is having its moment. She points to the growing number of clothing swaps and Facebook buy and sell groups as signs.